Captain Dave Monti with the eight pound tautog he caught near General Rock, North Kingstown, RI this Sunday using green crabs. 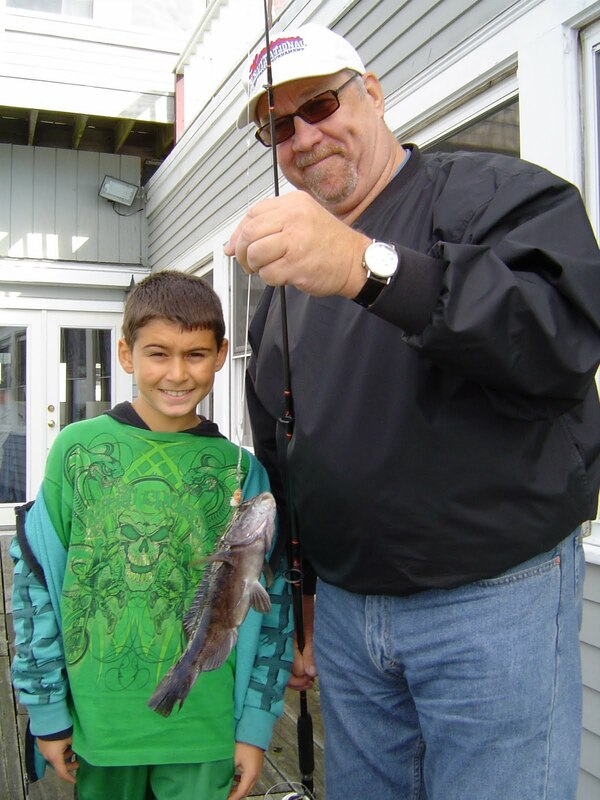 The tautog fishing is improving with larger fish being caught as the water cools. Tautog (or Blackfish) is a great eating fish with nice tasting white meat. 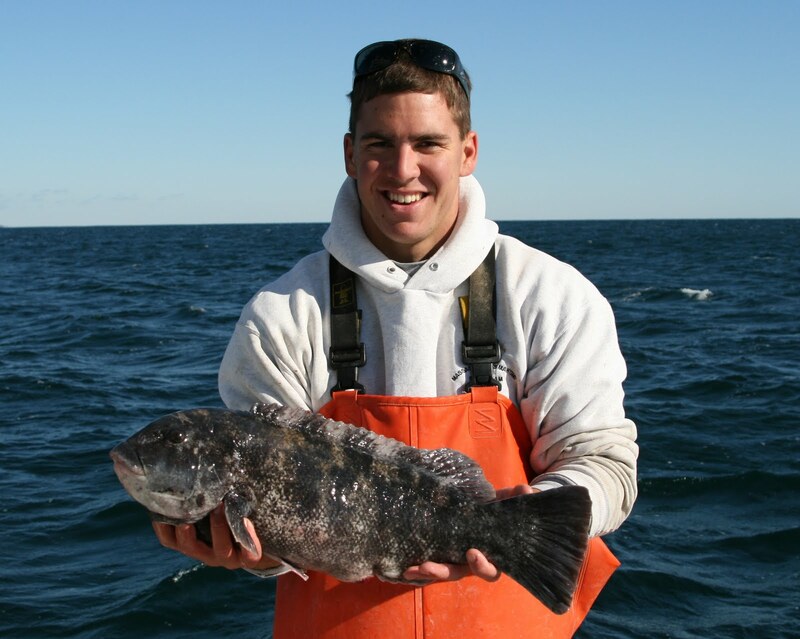 Rhode Island’s Department of Environmental Management regulates recreational tautog fishing. The catch limit this time of year is six fish/person/day with a ten fish boat limit (the ten fish boat limit does not apply to charter and party boats). The season ends December 15. Here are nine tips to help you have a great fall tautog season. Some have appeared in previous columns but are worth repeating. 1. Find structure to find tautog. Tautog can be fished from shore or boat and in both cases they like structure (rocks, wrecks, bridge piers, dock pilings, holes along the coast, etc.). So, no structure, no tautog. 2. Fish where the fish are. This is particularly true with tautog because they are a territorial species, you have to find the tautog. They are not going to find you. So if you get no bites move to another spot. When you find them, you find them and the bite is on. 3. Boat placement is important. Find structure, estimate wind/drift direction and anchor up current from where you want to fish and drift back to the spot as the anchor is setting. Once in position fish all sides of the boat. Ken Landry of Ray’s Bait & Tackle suggests casting a bit to cover as much area as you can. If still no bites let some anchor line out to change your position, if still no bites it is time to move the vessel. 4. Green crabs or Asian crabs are the baits of choice in the fall. When using green crabs make it easy for the tautog to bite and take the bait. Break off claws and legs, cut the crab in half and hook it through one leg socket and out another. Tautog rigs are simple many anglers prefer rigs with one hook. 5. Losing rigs is common when tautog fishing due to bottom hang ups on rocks and structure. To save tautog rigs, I use elastics to attach my sinkers so the elastic breaks when caught in structure and you same the rig. I also use egg sinkers depending on the conditions. 6. Fish lodged in structure. Here is a tip from George Poveromo’s “Rock’em Sock’em” article that appeared in this month’s issue of Saltwater magazine. When a fish is hooked and it has muscled its way back to structure, apply pressure forcing a respectable amount of bend in the rod. If the fish is not moving, pull or pluck the fishing line like a banjo or gaiter string. The sharp vibrations emitted work their way back down to the fish through the line and irritate it. The fish in a state of confusion may back out of the hole to free itself from the irritation. Once you sense this has happened start pumping and reeling in the fish so it does not muscle its way back into the structure. 7. Feel the bite… tap, tap and then get ready for a tug of war. I believe with the first tap the tautog is positioning the bait for consumption. So at the second or third tap I raise the rod up firmly feeling the weight of the fish (no need to jerk the rod up hard). Once the fish is hooked, keep the rod up and pressure on so the fish in not able to run for cover. 8. Use braid line with little drag. Braid line allows you to feel the fish tap. Monofilament line will stretch allowing the fish to run for cover, braid line does not stretch. It is important to put little drag on the reel and apply continuous pressure so the tautog comes up and does not go back down to hide in structure once you have it hooked. 9. Where to fish for Tautog. From shore look for rocky coastline like Beavertail Point on Jamestown, locations off Newport and off breakwater rock walls at South County beaches. From a boat I have had good luck at Plum Point light house next to the Jamestown Bridge, the rock jetty north of Coddington Cove in Portsmouth, off Hope Island, around Brenton Reef in Newport, Whale Rock, Ohio Ledge in the East Passage and any other place there is structure, debris, rock clusters, wrecks, etc. Preliminary results from a 2011 survey conducted by researchers at the Virginia Institute of Marine Science (VIM’S) suggest the production of a strong class of young-of-year striped bass in the Virginia portion of Chesapeake Bay. The 2011 year class represents the group of fish hatched this spring. The results are good news for anglers who fish for this prized species. This year’s class is expected to grow to fishable size in three to four years. Anglers have expressed concern over the health of the striped bass biomass with fewer fish being caught over the past three years, particularly those fishing in Narragansett Bay and along coastal shores. So the news is good as these fish migrate to Rhode Island and the Northeast. The 2011 study recorded more than 27 fish per seine haul, significantly higher than the historic average of 7.5 fish per seine haul. This is a significant increase from recent years, during which catches of young fish were average. Although survey results show that numbers of young-of-year striped bass in Virginia have been average to above-average since 2003, results from a similar survey in Maryland indicate that numbers of juvenile striped bass there were below average in 2008, 2009, and 2010. Striped bass bite is slow along southern coastal beaches this week. Ken Ferrara of Ray’s Bait & Tackle, Warwick said, “The striped bass and blues have followed the menhaden all the way up Apponaug Cove to my bait shop and all the way up to Post Road.” This weekend anglers enjoyed snagging the menhaden and then putting them right back into the school in hopes of catching a bass or bluefish. Some anglers were cutting them into chunks and weighting the line to send it down to the bottom. Bass fishing on the Southwest side of Block Island remains hot with many fish in the 30 and 40 pound range being caught. 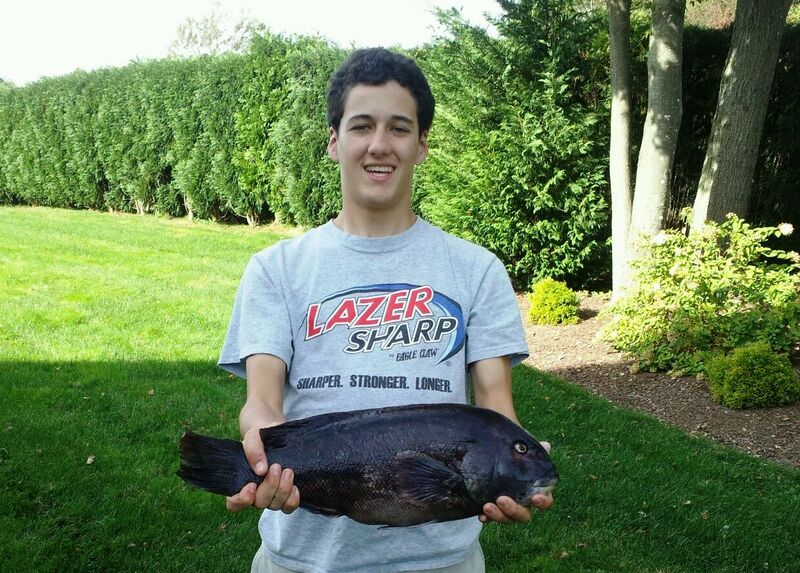 Tautog fishing continues to improve. I caught four keepers at Hope Island and General Rock this Sunday. The largest fish was eight pounds. The eight pound fish took a green crab half in about fourteen feet of water. Francis Fleet reports a good tautog bite this weekend. 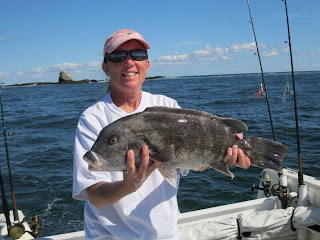 This Sunday Connie Tu from West Warwick, RI caught five tautog including the nine pound pool winner. Cod fishing is improving with anglers catching some fish in the teens with no large fish being caught yet reports the Francis Fleet. Greg Anthony, East Providence and Charlie Wood, Barrington with one of the tautog they caught on Greg’s first ever saltwater fishing outing. Greg (nine years old) caught three tautog during the first 45 minutes of fishing before the bite shut off. Chris Catucci of Warwick, RI caught this keeper tautog at Warwick Neck from shore while casting a green crab at rocks using an Eagle Claw 3/0 2x long hook with a two ounce sinker. Shallow Water Striper University will be held February 18 and 19, 2012 at the Sheraton Motor Airport Inn on Post Road in Warwick, RI. Speakers this year include: Capt Joe Pagano, Capt. Jim White, Don Smith & Peter Vican (two of the best big bass anglers in New England), Dave Pickering, Armand Tetreault (RI Poppers), Roland St. Denis on Kayaks, Capt. Pat Rena (T-Man Tackle), columnist Capt. Dave Monti, Capt. Jack Springel, and Mike Laptew. The cost of the weekend remains the same as last year, $89.00 per angler. Reservations are now being accepted, Call Captain Jim White with questions at 401-578-9043. The DEM menhaden species management plan outlines commercial equipment that can be used to fish, quotas, etc. and the fishery is highly monitored. The Department of Environmental Management (DEM) announced that the bay scallop harvest season opens at sunrise on Saturday, November 5 (not November 7 as previously announced) and continues until Saturday, December 31 at sunset. Rhode Island striped bass record holder Peter Vican, Don Smith and Captain Bill Silvia will speak Monday, October 24, 7:00 p.m. at the Rhode Island Saltwater Anglers Association monthly meeting at the West Valley Inn in West Warwick. Captain Silvia will speak about fishing for monster fluke. I was reminded how helpful bait and tackle shops can be to anglers this weekend when I visited John Littlefield, owner of Archie’s Bait & Tackle, East Providence, RI with my fishing partners for the day. It was the first time Greg (nine years old from East Providence) was going salt water fishing. John took great care of Greg Anthony and Charlie Wood of Barrington, sharing tackle, bait and location tips to make sure Greg hooked up with some fish on his first outing. We fished from shore for tautog and within the first 45 minutes, Greg hooked three tautog, making his first outing a success. I ask a million questions when visiting bait and tackle shops and you should too. They are very helpful. John, thank you for making this young angler’s first outing a success. DEM’s Marine Fisheries Section has released the first annual report on RI’s Recreational Saltwater License Program. The report provides an overview of the program, covering the nearly 18 months since it took effect, and sets forth a proposed FY12 programmatic budget, drawing upon the license fee revenues received since April 2010 and projected through June 2012. The report is being submitted to the Rhode Island Marine Fisheries Council, and will be reviewed at their next public meeting on November 1, 2011 at 6 pm (Corless Auditorium, URI Bay Campus, Narragansett). Drifts or anchors up near/on structure… rock piles, jetties, wrecks, etc. Tautog. Windy weather and high seas keep many anglers on shore this weekend and Monday for tautog fishing but the bite is improving as the water cools. Chris Catucci of Warwick caught two nice keepers and a dozen shorts from shore on Warwick Neck using green crabs and Eagle hooks. Tautog being taken at Monahan’s Dock and Hazard Rock in Narragansett said Al Conti of Sung Harbor Marina but bite around Block Island and off shore is slow. Kevin and Albert Bettencourt of East Providence caught nice tautog last week at Conimicut Light but the bite was not as good as the week before last. Scup and black sea bass still very plentiful in the Bay and offshore. Al Conti of Snub Harbor Marina reports Point Judith, Center Wall, and Nebraska shoals are still producing good numbers of scup and black sea bass. As reported last week the scup have been very large. Chris Bellavance with a black sea bass caught off Block Island on Priority Too Charters out of Point Judith. Perfect sunset… angler Tom Peters of Warwick caught this 15.6 pound bluefish on his way back from Block Island this weekend in front of Quonset Point, North Kingstown. The bluefish was caught on menhaden that was put back into the school he snagged it from (the school is the circular ripple behind him in the upper right corner of the photo). The Department of Environmental Management (DEM) announced that the bay scallop harvest season opens at sunrise on Sunday, November 6 and continues until Saturday, December 31 at sunset. Residents can take up to one bushel of scallops per day without a license, and commercial license holders can take up to three bushels per day/per boat from state waters. Non-license holders cannot offer scallops for sale. Harvesters are reminded that possession of seed scallops is prohibited. Legal scallops possess a defined, raised, annual growth ring. To protect scallops and bottom habitats from dredge damage, scallops can be harvested by dip-net only from a boat from November 6 through November 30. Dredging will be allowed after November 30 to access remaining adult scallops residing in deeper waters. Additional information on bay scallop harvesting is available on the DEM website at www.dem.ri.gov/pubs/regs/regs/fishwild/rimf5.pdf . The West Bay Anglers will hold its first weekly “Lobster Raffle” on Saturday, November 5 at the Fraternal Order of Police Loge #7 in Warwick, RI. They raffle off a lot more than lobsters. They actually raffle hundreds of prizes throughout the year; from flat screen TV’s to turkey’s, roasts and lobsters. Lunch for a great price is available throughout the two to three hour event each Saturday. The “Lobster Raffle” events run throughout the fall and winter months. Pam Tameo, president of the West Bay Anglers, said, “We raised about $16,000 last year with our Lobster Raffles, half went to this Take-a-Kid-Fishing initiative and half went to the non-profit Impossible Dream.” For information e-mail Pam Tameo at wbapamtam@cox.net . The Rhody Fly Rodders first fall meeting will take place Tuesday, October 18, 6:30 p.m. at the Riverside Sportsman Club off the Wampanoag Trail on Mohawk Drive. The Rhody Fly Rodders is the oldest American salt water fly fishing club. Captain Bob Hines will speak about Steelhead Fishing in the upper New York State area. The meeting will start with a cookout. For information contact member Peter Nilsen at pdfish@fullchannel.net . A public hearing on menhaden quotas for 2012 was held Wednesday, October 5 by the Atlanta States Marine Fisheries Commission (ASMFC) at the URI Bay Campus, Narragansett, RI. The meeting was held to discuss comments on proposed regulations as the menhaden population has declined by 88 percent in the last three decades. Steve Medeiros, president of the Rhode Island Salt Water Anglers Association (RISAA), and RISAA members, proposed a 37 percent reduction for a total harvest of 143,200 metric tons. This is a very important species for salt water anglers. Historically menhaden has comprised 70 percent of the diet of the striped bass. They now account for just 7 percent and bass, particularly in the Chesapeake, have shown signs of malnutrition. One company Omega Protein of Reedville, VA landed over 80% of the menhaden, the remaining 20% was landed by commercial bait boats and recreational anglers as ASMFC records show. The ASMFC will take regional hearing input into consideration as it develops menhaden regulations for 2012 at their November, 2011 meeting. Public comments can still be submitted until 5 p.m. Nov. 2, 2011. Direct them to Toni Kearns at tkerns@asmfc.org or by mail at Toni Kearns, AMFSC, 1050 N. Highland St., Suite 200 A-N, Arlington, Va, 22201. Scup regulations: in Federal Waters (Outside of 3 Miles) is June 8th to September 26th open at 10 fish per person 10.5 inches. Closed after September 26th. Scup in State Waters (Inside 3 Miles) October 12th to December 31st shore and private anglers as well as party and charter boats are at a 10 fish/person/trip limit. Fish have to be 10.5 inches for private anglers and 11 inches for party and charter boats. Black Sea Bass regulations: in Federal Waters is May 22nd to October 11th open at 25 fish per person 12.5 inches, October 11th to October 31st Closed, November 1st to December 31st open at 25 fish 12.5 inches. 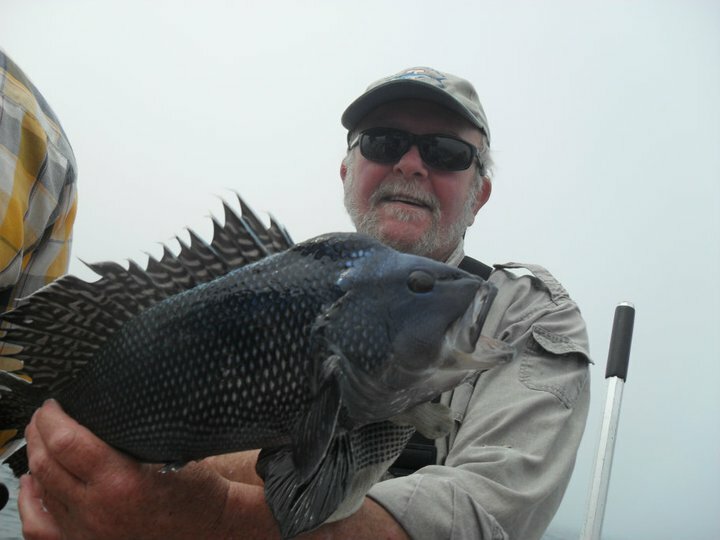 Black Sea Bass in State Waters for recreational anglers and party/charter boasts is July 11th to December 31st open at 12 fish per person 13.0 inches. Striped bass fishing at Block Island remains good although it is not as outstanding as it has been the past couple of weeks. Anglers taking small and large fish with eels but they are as plentiful. A few fish are being caught under the menhaden schools that are in the West Passage of the Bay. 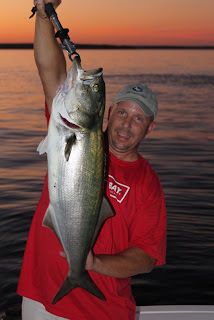 Angler Mike Swain of Coventry related he has been catching bass with chucks and live menhaden in the West Passage from the mouth of the Bay to Quonset Point… anywhere you usually find bass. Ken Ferrara of Ray’s Bait & Tackle, Warwick said customers have been catching bass by snagging porgies they find in the West Passage, cutting them up into chunks and then sending them down on the edges of the menhaden school to the bottom with sinkers to get them beyond the bluefish. Menhaden. Dave Henault of Ocean Sate Tackle, Providence, commented on the common reference to menhaden schools as being menhaden pods. He said, “Mammals swim in pods, finfish swim in schools.” So as Dave related, the menhaden pods you see in the Bay are not pods, they are schools. 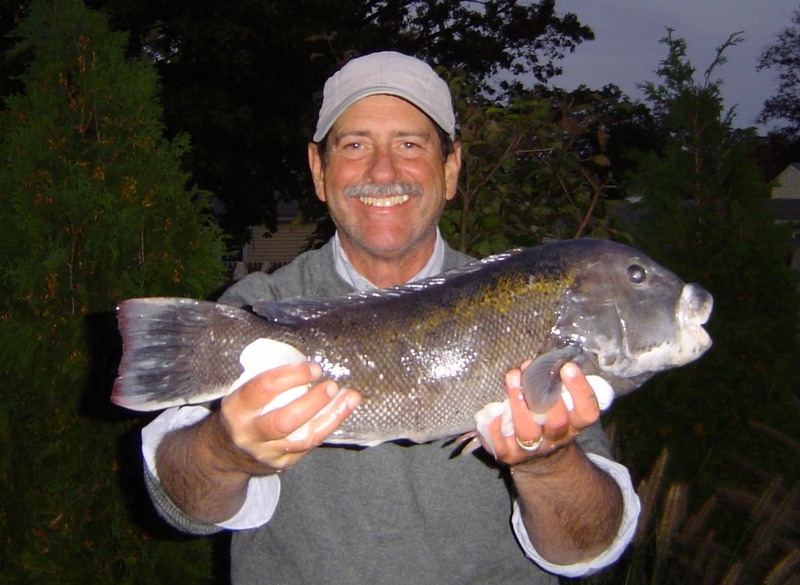 Tautog fishing reports in the Bay have been spotty. Most anglers are catching fish but the keeper to short ratio has not been good. Some good fish being caught along the coastal shore on rock piles off Narragansett and around Block Island. Bluefish. No schools on the surface reported yet monster blues are being caught in the menhaden schools throughout the West Passage. Tom Peters of Warwick caught a monster 15.6 pound bluefish under a menhaden school off Quonset Point this weekend. Find a menhaden school and you likely have found bluefish, now all you have to do is catch one. This weekend I had a surreal experience in Greenwich Bay. There was no wind, it was foggy and a light gentle rain was falling when I found myself in the middle of a large menhaden pod. It had a diameter of about 40 yards. There were plenty of other pods (six that I found) in the same area, that were fifteen to thirty feet in diameter, but nothing this large. I miscalculated and gently drifted through this pod while fishing the edges. The pod was so large that when my boat was in the middle it was like being in the eye of a hurricane. Though there was no activity in the center, menhaden were swirling all around my boat with dorsal fins out of the water and an occasional bluefish crashing through the school. A menhaden pod this large in open water was something that I had not experienced in a long time. These menhaden have been in Greenwich Bay for three weeks now. I also found them off Warwick Neck, Quidnesset Country Club and Quonset Point in North Kingstown. They were just about everywhere in the West Passage of Narragansett Bay. Last year menhaden commercial fishing boats were restricted from fishing north of Conimicut Light in the East Passage and not allowed to fish in Greenwich Bay with a boundary line from Warwick Light to Sandy Point. No official scientific proof but these efforts along with other regulations and the State’s commercial monitoring program seem to be working as the menhaden are thick in Greenwich Bay. In a Rhode Island Saltwater Anglers Association (RISAA) newsletter article (www.risaa.org), Dan Pedro relates that “Menhaden serve as roving filters, converting algae into energy and thus reducing nutrient loads”. Pedro continues to say that Atlantic menhaden occupy two distinct types of feeding niches during their lifetime: they are size-selective plankton feeders as larvae, and filter feeders as juveniles and adults. An adult menhaden, through its unique filtering gills, is able to process up to 4 gallons of water per minute or a million gallons of water every 180 days. Multiply this by the number of menhaden in Greenwich Bay alone this year and this is an amazing amount of water being filtered, a reduction of nutrients means fewer algae blooms and ultimately more oxygen for all fish. In addition, menhaden have a great value to both the commercial and recreational fishery. Commercial fishermen harvest them as bait for lobster traps as well as fish sold to bait shops for recreational anglers. Recreational anglers use menhaden to catch striped bass and bluefish. Menhaden are an important food source for striped bass and bluefish. In fact, in a Chesapeake Bay study conducted several years ago a reduction in the menhaden biomass led to malnourished striped bass, which led to disease, specifically mycobacteriosis. Mycobacteriosis is a disease that reduced the number of young fish in the Chesapeake, and a disease that can be transmitted to fishermen from handling fish with sores as they can enter a human body through a cut or open wound (visit www.noflukefishing.blogspot.com for additional articles on the topic). Do menhaden spawn in the Bay? Jason McNamee, of the Fish and Wildlife Division of DEM, said last year at a menhaden fisheries advisory panel meeting that menhaden do spawn all year long up and down the east coast, that peak spawning occurs offshore in winter. However, he said that juvenile fish referred to as “peanut” size fish could not have migrated all the way from the North Carolina coast. The current understanding is that these fish could not have come from further than Long Island and could have come from fish spawning in and around Narragansett Bay. So protecting spawning fish in Narragansett Bay is very important to the vitality of this fishery. How is this fishery managed? Narragansett Bay, in its entirety, is designated a Menhaden Management Area and the fishery is monitored and managed by the Department of Environmental Management (DEM). Regulations include catch limits, equipment used to catch them (size and types of boats and nets) and fishing periods that govern all commercial menhaden operations. 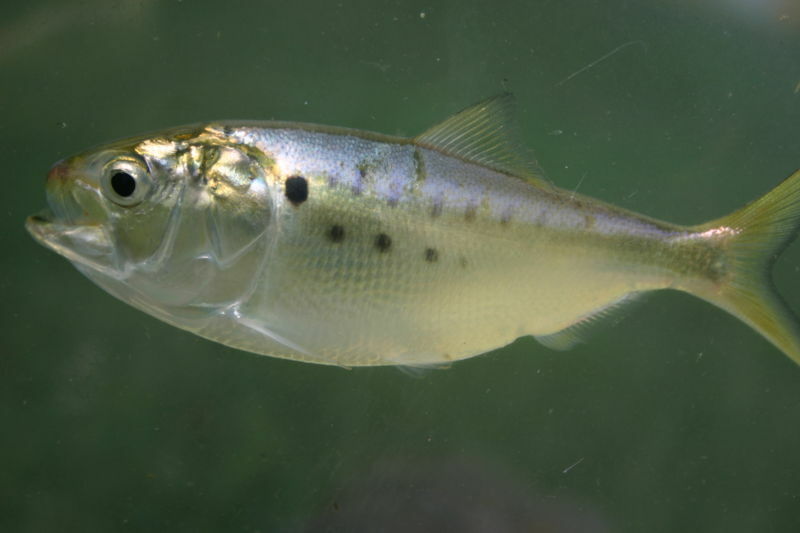 How to fish a menhaden pod for bass and bluefish? Snagging menhaden and using them live as bait or chucking them up and placing them on a hook as bait are two popular ways the fish are used to catch striped bass (and bluefish). Anglers often snag menhaden using a treble hook, quickly pulling it through a pod, hooking a fish and retrieving it. The menhaden is then placed on a hook through the nose or halfway down the back of the fish and put back in the water to swim with the school as bait. Many place the fish right back in the pod, others fish down current of the pod and get their live bait (or chucked fish) down to the bottom as bass generally feed on the bottom from scraps that fall after bluefish rip though the pods. This week, DEM extended the scup season. In a press release DEM said, “In order to increase access to the overstocked scup population and thereby afford relief and reduce the ecological peril faced by the tautog population which has been declared to be “overfished,” DEM Director Janet Coit has determined that it is necessary to adopt regulatory amendments via emergency rule making in order to extend the recreational season for scup until December 31.” A ten fish/day/angler limit is in effect, with a 10 ½” size limit. Tuna fishing for giants still very slow with few fish being caught so far this year. Yellowfin tuna fishing has been OK. Frances Fleet had a great overnight tuna trip this weekend. Yellowfin tuna to 75 pounds were caught. Two swordfish were caught in the 100 to 125 pound range. Their next tuna trip is scheduled for the Columbus Day weekend. Visit them online for details at www.francesfleet.com . Cod fishing has been slow this week. Some fish being caught on party boats but overall anglers have not aggressively targeted this species yet as striped bass, scup, sea bass and tautog are still all being fished. Scup fishing remained good this weekend as the season has been extended by DEM. Anglers in Narragansett Bay as well as on party boats report a good scup bite. Many large fish being taken on the Seven B’s party boat this weekend. Striped bass fishing in and around Narragansett Bay continues to improve. John Wurnner of John’s Bait & Tackle, North Kingstown said keeper striped bass have been taken in the East Passage using eels in the Providence River by angler Mike Swain of Coventry. Craig Castro at Erickson’s Bait & Tackle said, “Customers are catching bass using live menhaden between Prudence Island and Hope Island.” Greenwich Bay menhaden pods are attracting bluefish but there have been reports of some bass being taken too. Block Island bass bite slowed a bit this week. Fish caught on the Southwest side have been smaller than usual, in the 20 pound range rather than the 30 and 40 pound fish that were caught earlier in the month. By the end of the week, larger fish started to appear again. Bait of choice is still eels. Bluefishing continues to pick up in Narragansett Bay with large fish now being caught in the West Passage from Greenwich Bay to Quonset and beyond as the bluefish feed on large and small pods of menhaden. Bluefish bite off coastal shores and at Block Island is strong as well. Tautog fishing has gotten off to a slow start as anglers continue to target other available species. Fishing for tautog has been fair to good. Fishermen and government officials that helped get three fisheries bills passed and signed include (from left to right) Janet Coit, director of RI DEM; Steve Parente of the RI Commercial Rod & Reel Association; Rick Bellavance, president of the RI Party &Charter Boat Association; Governor Lincoln Chaffee; and Steve Medeiros, president of the RI Saltwater Anglers Association. Rich and Gisele Golembeski (in photo) of Woonsocket, RI fished rock piles off Beavertail and Narragansett, RI this Saturday and landed four nice black sea bass and four tautog including this 7 pound, 10 once tautog. Last week Governor Lincoln D. Chaffee held a bill signing ceremony in Galilee at Salty Brine State Beach… Governor Chaffee, Salty Brine and striped bass… you can’t get much more Rhode Island than this. Hats off to the Governor for jumping right on ocean and fisheries issues when coming into office. The three bills signed, all relating to fisheries, were in the works as he ran for office. The bills passed and without skipping a beat he signed them last week. 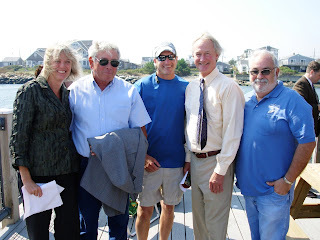 The bills include the creation of the Rhode Island Seafood Marketing Collaborative of 2011 that aims to support local fishermen and small businesses encouraging locally produced and harvested seafood; a bill that enhances penalties for illegally taking or possessing striped bass to deter poaching of this prized game fish; and the third bill authorizing unlicensed rod and reel fishermen serving as crew to assist licensed commercial rod and reel fishermen in harvest operations (this corrected an inequity e.g. for years unlicensed crew have been able to assist licensed commercial draggers, but not rod and reel fishermen). Congratulations to members of the general assembly that led the charge on these bills including Senator Susan Sosnowski (D-South Kingstown and New Shoreham), chairwoman of the Senate Fisheries Taskforce; Representative Teresa Tanzi (D-Narragansett and South Kingstown), who created the Port of Galilee Task Force through a house resolution; and to Janet Coit, director of the Department of Environmental Management (DEM) for not missing a beat either (she became director just eight months ago and marshaled her staff and department’s efforts to support the three bills). Senator Sosnowski said that our goal should be to put, “Rhode Island harvested seafood on every Rhode Islander’s plate.” She said, “This is very important to all of us, it is a great feeling (to have the bills signed).” Director Coit thanked the Governor, members of the General Assembly and made it a special point to thank Steven Medeiros, president of the Rhode Island Saltwater Anglers Association; Rick Bellavance, president of the Rhode Island Party and Charter Boat Association; and all fishermen that testified to help get the bills passed. Others members of the General Assembly leading the way as chief sponsors of the three bills include Rep. Peter Martin, Rep. Peter Palumbo, Sen. Michael McCaffrey and Sen. James Sheehan. Governor thanks for signing the bills so quickly. They will go a long way to promote the fishing in Rhode Island… to protect our treasured striped bass… to allow rod and reel fishermen the help they need to harvest… and to explore ways to help fishermen get the catch to market quickly selling fish caught here in Rhode Island, to Rhode Islanders. I did ask Governor Chaffee about his personal fishing experiences. As a child growing up in the Potowomut section of Warwick, RI, he said, “We fished right in the neighborhood… but I haven’t had a chance to fish recreationally recently.” I’m sure a lot of recreational anglers feel the same way I do… Governor Chaffee… we will just have to get you out on the water soon. In August, the Atlantic States Marine Fisheries Commission, which sets policy for species that migrate along the East Coast, proposed a revision to its menhaden management plan that could reduce menhaden catches. ASMFC has opened the plan for public comment. Rhode Island’s DEM Division of Fish and Wildlife will hold a public comment hearing on Atlantic Menhaden draft amendment on October 5, 2011 at the URI Bay Campus, Corless Auditorium, in Narragansett, RI. Call Jamie McNamee at DEM for information. Black sea bass fishing good. Fish being caught off Beavertail, Narragansett and most places where anglers are targeting tautog. I caught several keepers while tautog fishing at Coddington cove this past Saturday.